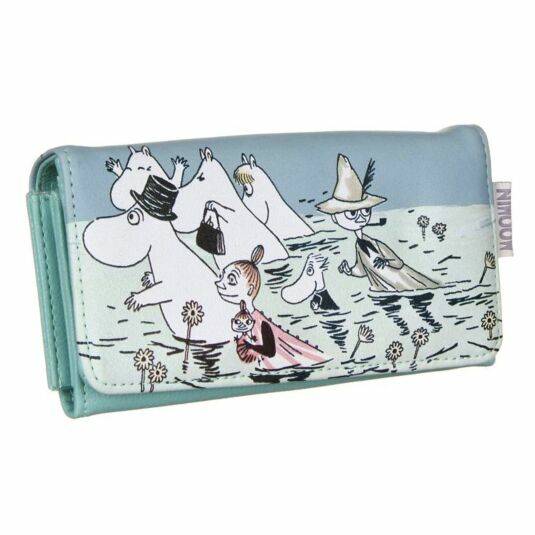 The intrepid Moomin family and their friends are pictured wading through waist high water on this wallet from Disaster Designs, in a scene from Moominsummer Madness. Moominpappa wearing his top hat and Moominmamma holding her handbag high, are accompanied by Moomintroll, the Snork Maiden, Little My in the arms of her sister and Snufkin with his pipe, glancing back over his shoulder. Fans of the books will remember the magical tale of how a flood inundates Moomin Valley one summer, pushing the family out of their house and into a floating theatre, resulting in a hilarious sequence of backstage hauntings and onstage theatricals. 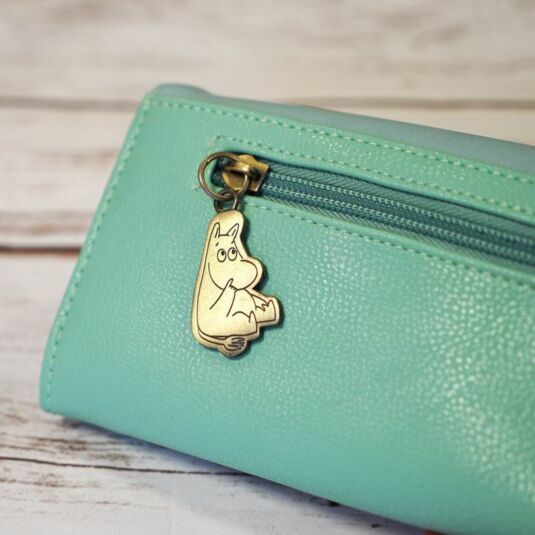 The wallet is a lovely combination of duck egg blue and duck egg green, with the water represented by the green end of the spectrum. The family are depicted on the front in Tove Jansson’s unique drawing style, with light-hearted lines and pale colours. 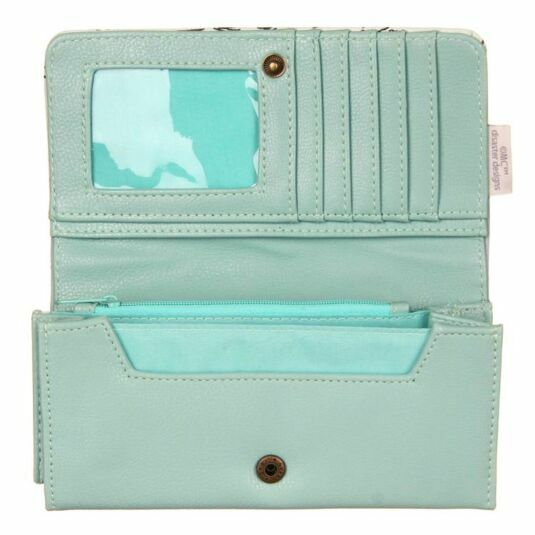 Inside, the faux leather wallet is a pretty shade of pale turquoise, lined with matching cotton. There are five credit card slots and a clear plastic window for ID or photo on one side, and four long compartments, including one with a zip on the other. 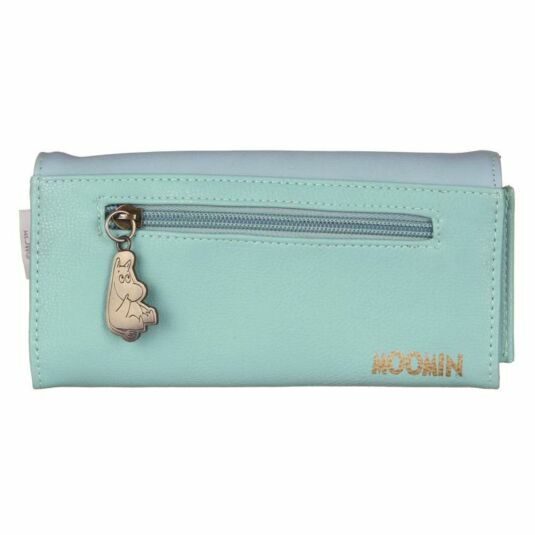 The word ‘Moomin’ is embroidered into a cotton label and repeated in gold on the back of the wallet. There is a further zipped compartment on the back, finished with a lovely detail, a brushed gold tone metal zipper pull in the shape of Moomintroll, seated with a bemused expression on his face. 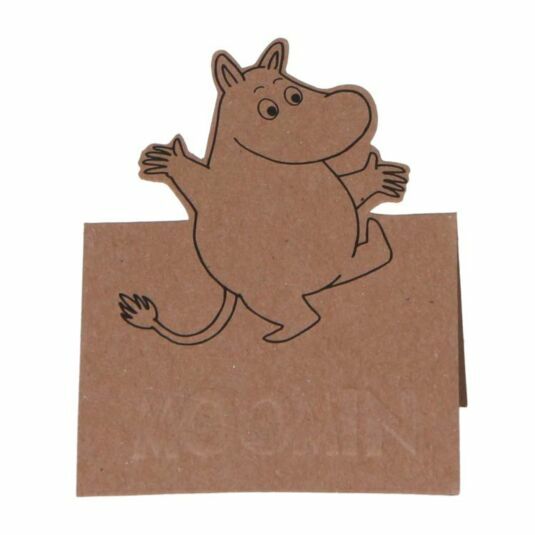 With their usual attention to detail, Disaster Designs have even included a card product label which can be folded to stand up, embossed with the Moomin logo and featuring a dancing popup Moomintroll. 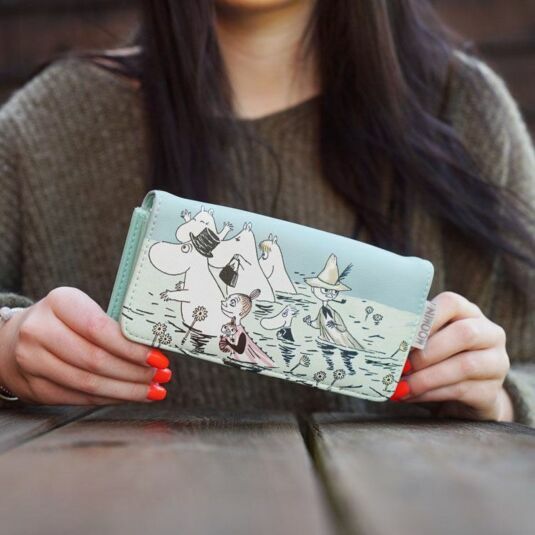 This wallet makes a lovely gift for anyone who enjoyed the tales of the Moomins in their childhood, but also simply as a quirky piece with a pretty image. 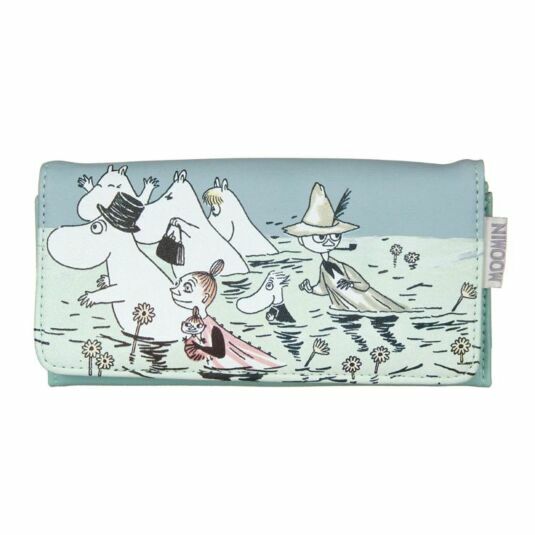 Its practical design means it will always be useful and iIt makes a lovely gift for girls of all ages, from daughters to mothers and granddaughters, as the legacy of Tove Jansson dates from the 1940’s and her books have never been out of print. Tove Jannson’s Moomin books have been loved by generations of children since they first appeared. She wrote and illustrated them with humour and detail, and they were made into comic strips and TV cartoons as well as the original series of nine books. There is also a Moomin theme park in Finland. The characters are based on people she knew as a child, redrawn as animals with fantastic names and appearances. 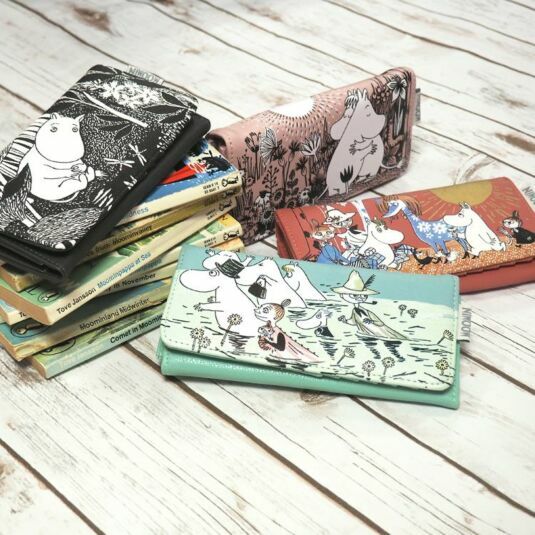 Disaster Designs have recreated scenes from the books for this whimsical range of items, which will be loved by Moomin fans, lovers of children’s literature and anyone who enjoys unusual design.